Well, well, well. It’s turns out that we now have a regular and very popular event within walking distance of my kitchen that will provide food, drink, music, company and good times. My kitchen doesn’t do that. Not even for £5 per portion. 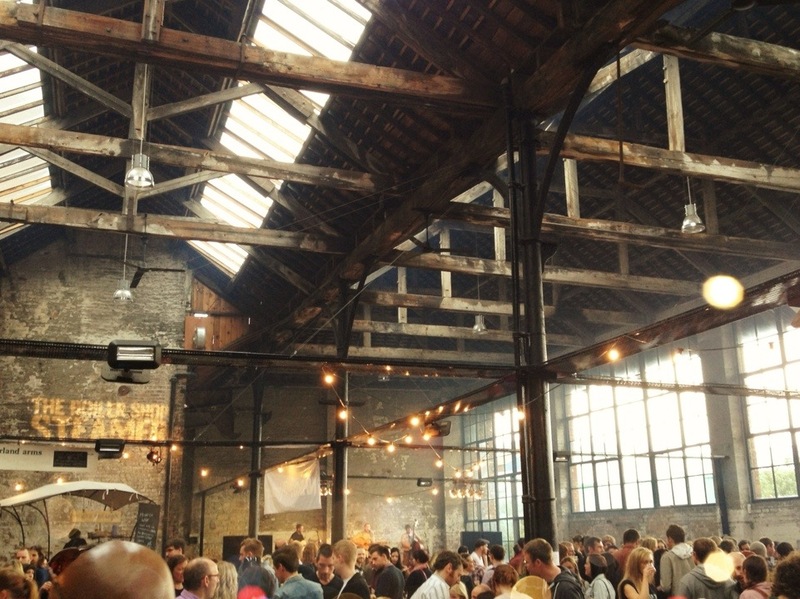 The Boiler Shop Steamer is held in the old Robert Stephenson Boiler Shop building on Sussex Street, on the first weekend of the month. The first Steamer event was thrown in April this year, making this month’s the third Steamer. It’s kind of like a monthly manifestation of the incredibly successful Urban Night Feast held in September 2012, which in turn is based roughly on the night food markets of London etc. I attempted to attend that particular Feast after a wedding, having been to the Beer & Chilli Festival last summer in the same venue, and unfortunately I arrived a little late. Several of the stalls were packing up and I only managed to nab myself a monkfish and cranberry jam wrap from Riley’s Fish Shack and a stone-baked duck, grape and rosemary pizza from the Pizzette oven. Both definitely worth mentioning. This time however, as soon as we had a child-free weekend and a Friday night off work, we mooched down to the old warehouse behind Central Station, a fistful of cash in our back pockets. For obvious reasons the Steamer is not too card friendly so it’s worth hitting a cash point on your way. Luckily the weather, though not as sunny as it had been earlier in the day, was holding up and that made for a particularly pleasant and relaxed atmosphere. We hung around outside for a while, enjoying the last strains of the sun, the fresh Newcastle air and the smell of “Real Whitby Fish and Chips” from the usually Saltburn-based Hungry Bassetts van. Eventually though we were too famished to wait any longer and entered the building. I noted that the venue had been decorated in much the same way that it has been previously, which is all very nice, but that some of the vendors were unfamiliar. There were of course the old favourites; Electric East, The Ouseburn Coffee Co, Papa Ganoush, and of course co-organisers the Wylam Brewery and Adam Riley of Riley’s Fish Shack. There were also some familiar faces from 9Bar Coffee, Teasy Does It and The Cumberland Arms. But happily there were also some I’m unfamiliar with in the shape of the afore mentioned Hungry Bassets, Big T’s Jerky and Las Paelleras. It’s always nice to see some new faces. I sampled some of the chicken shawarama from Papa Ganoush, the patatas bravas and chicken and chorizo paella straight from the vast Las Paelleras pans and, of course, a hearty portion of Electric East’s Rendang beef. Drinks wise I ‘tried’ a couple of Geordie gin & tonics, a Rum Cooler, a Radgie Rum and Ginger (all from The Cumberland Arms) and an espresso martini off of the OCC that will mean I won’t need sleep tonight. I’m holding that final treat entirely responsible for the fact that this post is being written so soon after the event. Attendees were treated to musical accompaniment whilst they munched. There were a few acts on the large stage occupying the far side of the building, and Lauren from Scran on the Tyne (more to come on that in the not too distant future) was DJ extraordinaire in charge of the tunes for the evening. I believe tonight’s bands included The Lake Poets, Razmataz Lorry, Sam Fender and Lionhall. I can’t lie and tell you I was 100% sure who was who, probably because I was so busy eating and chatting, but I enjoyed everyone I did hear. Finally, just incase you, for some worrying reason, were to grow weary of food, the company of other humans, drinks and music, there was an additional entertainment provided in the form of a pop up cinema (somewhere) and a pop up gallery space created by The Outsiders. So plenty of the key ingredients for a good night. If you were there tonight, you’ll know and understand everything I just prattled on about. I’ve no doubt bored and patronised you and perhaps simultaneously reminded you how keen you are for next month to rock round for the next Steamer. If however you *weren’t* a part of this weekend’s party I request that you give yourself a good shake and make a pinky promise to attend the next one. I would hope that if you’ve got any kind of taste for life, food and, in particular, street food and you live in or around Newcastle that I will bump into you at the next event. If so, please feel free to stop me and say “hi”. I’m quite nice really. Not too bossy. I just get very passionate about my food. Be nice to see you again too.